EvaNell Fostine Atwood, of Abilene, went to be with the Lord on Saturday, January 3, 2004 after a courageous battle against cancer. Graveside services will be held at 2:00pm, Tuesday, January 6, 2004 at Tuscola Cemetery with the Reverend, Dr. Fred Morgan officiating, and directed by Elmwood Funeral Home. Visitation will be at Elmwood Funeral Home on Monday, from 5:00 to 7:00 pm. Nell was born January 27, 1926 in Tuscola, to Robert Matterson McCall and Martha Turner McCall. She married William Russell Atwood on November 6, 1942 and they enjoyed 50 years together. They raised their family in Tuscola and Abilene. Nell loved the Lord and was a member of the Church of Christ. She lived her life for her family and was a devoted wife and mother. Before her health deteriorated, Nell loved bowling with her friends and working in her flower garden. 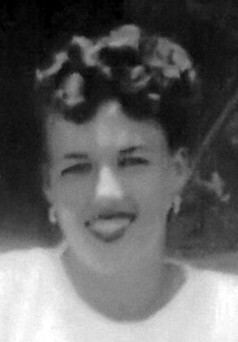 Nell was preceded in death by her parents and her brother Alvin McCall, her husband Russell, and her son, William Russell Atwood Jr. She is survived by her son James and his wife Frances Atwood of Paradise, TX; her oldest daughter, Sharon Yost of Sweetwater, TX: and her daughter, Janara and her husband Steve Bennett of Leander, TX; her grandchildren Kevin Atwood, Brian Atwood, Keith Atwood, Allison Frailing, Mark Atwood, Brooke White, Martha Yost, Ross Bennett and Hannah Bennett; 12 wonderful great-grandchildren; her brother Dan McCall of Tuscola and his children Donna Michie of Ft. Myers, FL, Gary McCall of Buffalo Gap and Angela Renner of Tuscola. Nell is also survived by her loyal and constant companion, her poodle, OJ. Nell had many other close relatives and good friends to whom she and her family will always be grateful beyond words for their unrelenting support and compassion throughout her life and her illness. Because of Nell's love for animals and her support of the Humane Society, if desired, memorials can be made to any organization that supports the rescue of homeless pets.